In reading about the world’s first explorers with my children, it was commonly believed that seamen venturing into the great unknown would fall off the edge of the world into oblivion. For parents concerned about the possible negative influence of the online social networking “world”, there’s hope and help as you navigate this new sphere. While concerns are valid, there is also great potential to reinforce spiritual lessons we’ve taught our children while they participate in online social networking such as Facebook. I got into Facebook when my second oldest child, Megan, was about 14. She wanted to connect with friends, being the “I need people regularly or I’m going to die” kind of kid. So, I started my own account to see who became part of her online world. From there, my other kids got online. And while it took a lot of oversight and discussion with my children about what is appropriate to post, how what we say online is there forever, etc., it has been very much worth it. I’ve seen my children encourage others through their expression of faith and life giving values. Let’s “face” it—Facebook has quickly become a part of life in the 21st century, providing a wonderful opportunity to reconnect with old friends, build long-distance friendships, and meaningfully stay in touch in a fun way. Chances are if your children aren’t using Facebook they will, either now or as adults. Before your teen joins Facebook (or even if they already have), engaging them with questions and drawing out their hearts can go a long way toward helping our children use this tool in a way that brings glory to God. 2. Be Aware of the Influence of Friends—as parents, we have a wonderful opportunity to talk to our teens about communicating with friends. All communication, including the internet, can potentially serve and edify others. If our children have ever received or written something that does not edify others, do we encourage them to ask for forgiveness or confront the friend sending the message? Ask your child to evaluate for themselves the net effect of their life and participation on Facebook and the influence their friends have on them. Is there mutual encouragement to love God and His Word more? 3. Be Careful How You Spend Your Time—I remember being challenged in a high school Bible study to monitor how much time I watched TV to see where my priorities were. How revealing that was! Time on the internet can be just as consuming of our lives if we’re not careful. Are there days we don’t read our Bible or pray but spend time online? Parents, it’s just as tempting for us to skew our priorities as it is for our children. Are we searching our own hearts even as we search our children’s? Are we confessing to them where we’re imbalanced and seeking God together for help to honor Him with how and how much we spend time online? 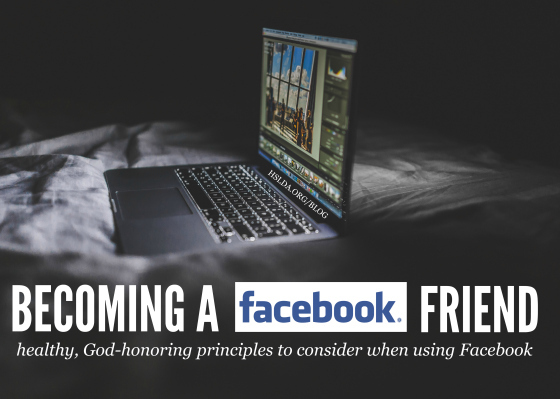 Facebook, like anything we do in life, can be a means to draw our hearts away from or to God. I’ve had challenges in my children’s use of it, but God has been faithful to provide me His grace as I dialogue with my children, engage their hearts, and seek the navigational direction of the Scriptures to chart our course in this great “unknown.” I’m thankful, by God’s grace we haven’t fallen off the edge of the world. Photo Credit: Taken by Luis Llerena, graphic design by Charity Klicka.